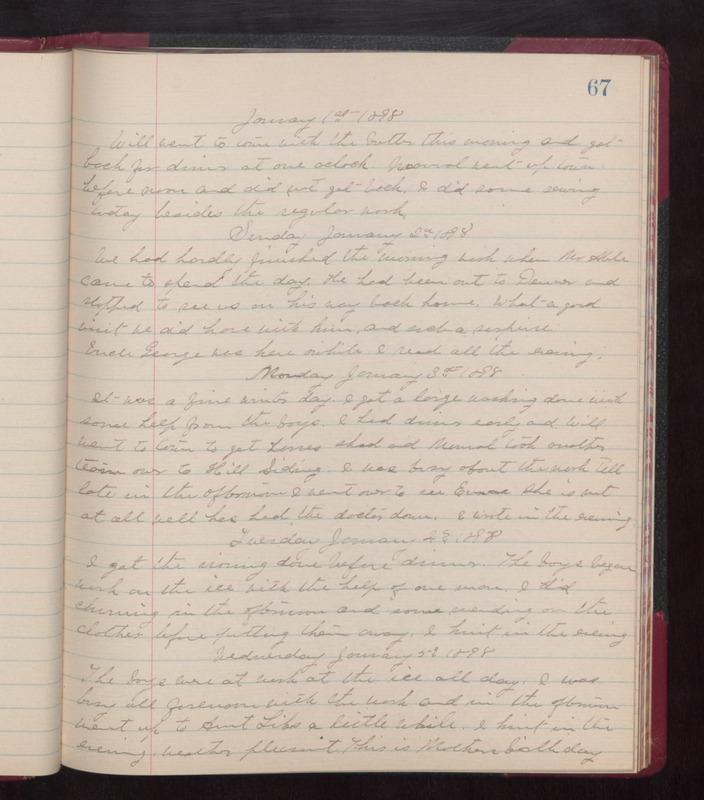 January 1, 1898 Will went to town with the butter this morning and got back for dinner at one oclock. Manuel went up town before noon and did not get back. I did some sewing today besides the regular work. Sunday January 2nd 1898 We had hardly finished the morning work when Mr Able came to spend the day. He had been out to Denver and stopped to see us on his way back home. What a good visit we did have with him and such a surprise. Uncle George was here awhile. I read all the evening. Monday January 3rd 1898 It was a fine wintry day. I got a large washing done with some help from the boys. I had dinner early and Will went to town to get horses shop and Manuel took another team over to Hill Siding. I was busy about the work till late in the afternoon. I went over to see Emma. She is not at all well had had the doctor down. I wrote in the evening. Tuesday January 4th 1898 I got the ironing done before dinner. The boys began work on the ice with the help of one man. I did churning in the afternoon and some mending on the clothes before putting them away. I knit in the evening. Wednesday January 5th 1898 The boys were at work at the ice all day. I was busy all forenoon with the work and in the afternoon went up to Aunt Libs a little while. I knit in the evening. weather pleasant. This is Mother's birthday.